In this post we'll examine five of the best online Reiki training courses. These courses can help you learn how to practice self-healing as well as gain the expertise to open your own natural-healing practice. To be clear, there are no 'real' certifications and most states don't require a license to practice Reiki (Source). Reiki is a healing technique used to help people relax and deal with stress and promotes healing. The idea behind Reiki is that hands are laid on a person to manipulate that person’s “life energy”. Reiki courses help people learn the methods and techniques for performing this treatment (Source). Reiki practitioners suggest healing the source of a person’s problem rather than the symptoms. It’s also noted that multiple treatments may be needed (Source). Udemy specializes in courses taught online. These courses include topics like massage, drawing, business and design. To participate in a Udemy Reiki course, you register and pay the required fee. If you want to learn crystal reiki healing, check out this course. If you're completely new and want a solid introduction course, check out this one. If you're looking to become a Reiki teacher, check out this one. If you want to learn self-healing, check out this course. If you're looking to practice Reiki on family members and friends, check out this option. 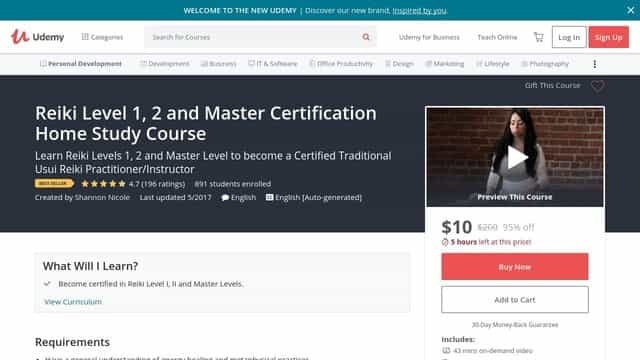 The individual Udemy pages below do feature video previews on the product page- so you're able to get a feel for the instructor prior to purchase. 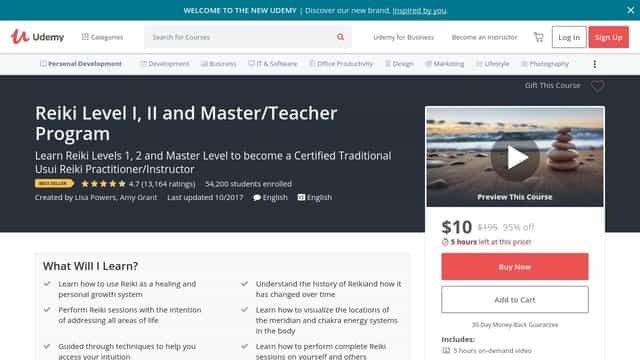 Here we'll take a deeper look at the Reiki courses offered by Udemy. The Reiki Level 1, 2 and Master Certification Home Study Course: Good course to introduce new students to Reiki and to take them through to being able to practice it competently. Reviewers say they were overall satisfied with the course, however, some noted issues with video quality and the lack of information provided in the PDF manuals. The Reiki I, II, III ART & III Teacher Qualification Course: Is designed to help you become a certified Reiki teacher. What stands out about this course is the amount of material you get, which is spread out over 50 parts. This is a complete course that takes one from beginner to master. Students spoke highly of instructor, Rosemary Owen, who teaches in a peaceful manner, although some noted her voice may have been too low a volume. Overall, a good, comprehensive course on this therapy. 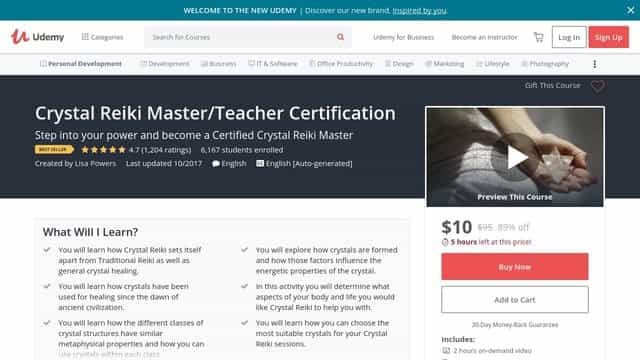 Next we looked at the Crystal Reiki Master/Teacher Certification course which is designed to show you the differences between Crystal Reiki and Traditional Reiki. This type of therapy involves crystals and is designed to help you become a certified master of this technique. Students say this course is a wonderful addition to traditional Reiki and that the information is thorough and well put together (Source). We also looked at the Reiki Level I, II and Master Certification Energy Healing Course, which is for those who want to learn Reiki to heal family members and friends. Through this course, you can also learn how to send healing over distances. Students should have a basic understanding of energy healing. Student feedback for this course is overwhelmingly positive with most users praising the perfect length of the lectures — not too long — and how the instructor was available via private message to help. 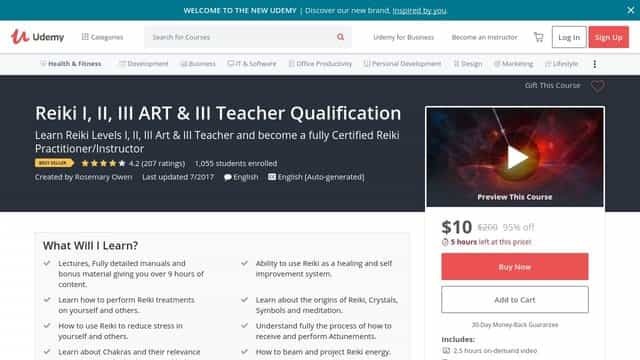 Finally, we reviewed the Reiki Level I, II and Master Teacher Program, which gives the students the tools they need to be a certified Traditional Usui Reiki practitioner/instructor. The Usui system is a healing practice focused on self healing. This course will enable students to heal themselves and experience personal growth. 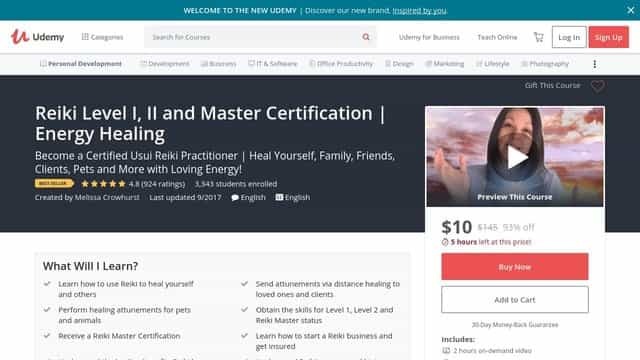 As with many other Udemy Reiki courses, this one is highly rated among participants and praised the instructor for offering clear, concise and easy to follow instructions (Source). The Reiki Level I, II and Master/Teacher Program is a good option for those who want to become a certified traditional Usui Reiki practitioner. Students love the thoroughness of this course, but some suggest adding more in-depth examples to better understand the given material. The goal of this online Reiki course is to learn how to use Reiki as a healing and personal growth system. It was designed by Lisa Powers, Udemy award-winning instructor, and Amy Grant, Reiki teaching assistant, who state that the lessons show you how to perform Reiki from a distance. This Reiki course might be a good choice for both beginners and individuals who want to take their practice to the next level. In general, students have a very favorable opinion of this intro Reiki certification course. They agree that the lessons are thorough yet concise, as well as that the instructors are very responsive. Students appreciate that the lessons are delivered in a manner that is easy to listen to and understand. However, some students state that it would be better if there were more in-depth examples. One online reviewer shares that sometimes it might be difficult to download resource materials. If you’re looking for an online Reiki course, you might want to consider the Reiki Level I, II and Master Certification | Energy Healing. Students like the structure and conciseness of the course, but some do complain of video quality and editing issues. This online Reiki course is suitable for those who want to learn how to harness energy healing for themselves, family, friends, pets, and animals. The founder of the course, Melissa Crowhurst, states that the lessons give powerful insights into how to take care of your mind, body, and soul, as well as into methods of attracting loving energy and abundance into your life. This course could be a good choice if you want to learn how to send attunements via distance healing to loved ones and clients. In general, students state that this Reiki energy certification course meets their expectations. They agree that the course is well-structured with a lot of beneficial information, as well as that the lessons are clear and concise. Students appreciate the instructor’s friendly demeanor. However, there are complaintsregarding the video quality and flow. As they say, the video seems a bit choppy and not edited perfectly. If you are looking for a top-rated online Reiki course, you might want to consider the Crystal Reiki Master/Teacher Certification. Students love the thoroughness of this course, but some do find it a bit abbreviated in comparison to other classes that the instructor offers. The goal of this course is to teach you how to choose the most suitable crystals for your Crystal Reiki sessions. As the instructor Lisa Powers says, you will also learn about sacred geometry and how to utilize fundamental patterns in your Crystal Reiki sessions. This course might be a good choice for individuals wanting to take their Reiki practice to the next level with the use of crystals. The general student consensus concerning this crystal Reiki training course is that it is thorough, very informative and well put together. Students appreciate that the lessons are easy to follow. They find the instructor to be very responsive. However, some students find the courseto be somewhat abbreviated. As they state, this class doesn’t have as much information as some other classes from this lecturer. The Reiki I, II, III ART & III Teacher Qualification could be a solid option if you want to understand fully the process of how to receive and perform attunements. Students like that the lessons are well-structured, but there are complaints regarding the volume which is not loud enough. This course comprises of three levels. Level I is said to teach you the origins of Reiki, the benefits of Reiki treatment and the correct positions required for a Reiki treatment. Level II is a much more in-depth course that introduces Reiki power symbols. The goal of the Level III is to teach you about attunements. The lessons were designed by Rosemary Owen, Usui Reiki Master and a senior Clinical Hypnotherapist. This course might be a solid choice for individuals with an interest in holistic therapy. In general, students have a good opinion of this Reiki teacher certification course and they conclude that it is a well-structured and clear program. Many online reviewers appreciate that it is informative, comprehensive and engaging. However, several students complain that the audio is quite difficult to hear at times. One highly disappointed online reviewer states that the videos are just a few pages of print in sequence with the author reading the scripts. The Reiki Level 1, 2 and Master Certification Home Study Course is a good option for those who want to learn how to perform Reiki on themselves and others to heal emotional, physical and energetic imbalances. Students like the straightforwardness of the lessons, but some do complain of poor video content. The goal of this Reiki course is to show you how to activate Reiki and give treatments to yourself and others, as well as how to upgrade your energy, release blocks and master the power of manifestation. Designed by Shannon Nicole, Master energy practitioner, the course is said to be of much assistance in learning how to perform attunements on others. This online drawing course seems like a good choice for those who have a general understanding of energy healing and metaphysical practices. 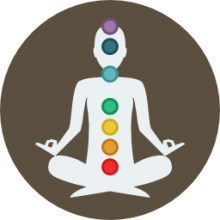 The general student consensus concerning this online Reiki certification course is that it is informative, easy to follow, straightforward and understandable. However,some students complain that the course consists of the lecturer mainly reading downloaded materials and a couple of PowerPoint presentations with very little input. In addition, one online reviewer shares that she reported the problem with videos which wouldn’t play, but received no response. Reiki (霊気) is a type of alternative meditation that was developed in 1922 in Japan by Buddhist Mikao Usui. Later Reiki was adapted into different cultural traditions all over the world. Practitioners of Reiki use a technique known as hands-on healing, during which the practitioner transfers a “universal energy” through his hands to the patient thus healing him/her from a physical or emotional suffering. This form of alternative medicine is a pseudoscience. Reiki is based on a universal life force called qi ("chi"). However, the existence of such a life force has not been proven empirically. Clinical studies have shown that as a medical therapy Reiki is not effective for any medical condition. According to the American Cancer Society, Cancer Research UK, and the National Center for Complementary and Integrative Health, Reiki cannot be a substitute for conventional treatment. It is important to note that the founders of Reiki, Dr. Mikao Usui, Dr. Chujiro Hayashi and Mrs. Takata, did not conduct distant attunements. The same can be said about Usui Reiki Ryoho Gakkai. The idea of Reiki distant attunements has recently been discussed with the most famous Reiki masters from different countries of the world and they all stated that distant attunements cannot replace the attunement given in person. Therefore it is recommended that people who want to receive a Reiki initiation take classes in person from an experienced Reiki master (Source). Reiki training programs can last from two days up to a few months, or even years. It depends on what level of certification the trainee wants to get. There is not a particular governing body determining the levels. However, most of Reiki schools do have several levels: beginning, intermediate and Reiki master level. The duration of beginning classes can be around two days, and can cost about $200, while Reiki master programs can cost up to $1,600 and the duration can be a year or even more. Reiki healing works with a person’s biomagnetic energy that flows through his/her body. Reiki practitioners are to stimulate the energy for promoting healing and lessening stress. Therefore Reiki students study anatomy, psychology, kinesiology and other subjects related to energy. They learn to be sensitive and to be able to feel the energy zones corresponding to various parts of the human body. Being experts in this field, Reiki masters are able to teach the art of Reiki to other practitioners as well. There are a number of private Reiki education organizations that teach this healing offering their own Reiki certification. Nevertheless, in most states a certification or license is not required for practicing Reiki (Source). One can as well join another professional organization, for example the International Association of Reiki Practitioners (IARP), to become a part of the Reiki community (Source). Yet there can be cases when your certification is meaningless. For instance, it might be prohibited to offer similar professional services in your country or city. In several U.S. states it is required to have a license to be able to practice natural health treatments. As Reiki is considered a spiritual healing art you might be required to have a certification of an ordained minister. Therefore, for starting your fact-finding mission it would be useful if you make some telephone calls to your local chamber of commerce. In addition, make sure to obtain liability insurance in case you need protection against lawsuits. Create an energy work and consent form and ask your new customers to sign it. In this way they will be informed in written form that Reiki is not a replacement for professional healthcare.